I'm in one of those January reflective moods.... neither one thing or the other, not happy, not sad, just pondering. Yes all the festivities were wonderful and I am deeply grateful for all the love and showering of presents and sparkles that were abundant. My photos from Paris seem to echo my feelings. I found Elspeth's last post very uplifting, find it here. Sarah, your photos are amazing, I dream of going to Paris one day. Thanks for giving me a quick fix. Reflecting can be a very good thing, hope you have a calm and restful week. Gorgeous pics of gay Paris. Wishing you a very Happy New Year! Oh those photographs bring back memories of my trips to Paris, such a beautiful city. Wishing you all the best in 2010. Oh great pics I'm hoping to visit Paris this year! you have whet my appetite! You are a really talented photographer!!! I love todays images in your post! The moon, the signs and streets, I´m speechless!!! I know what kind of mood you´re in... I feel the same. It must be, the holidays are over and it´s still such a long time left before the spring is here, don´t you think? Quite funny, we´re both travelling to Paris today... But only in our minds. Have a nice monday evening. Stunnng photos, I'm very much in love and filled with jealousy! I also share your new year not-quite-blues. Though I feel reluctant, I think I'm ready for my routine to come back and life's pace to pick up again! Oh, I'm so glad you like the poem. I thought I did not know John O'Donohue, but it turns out I have one of his books, Anam cara (translation: Soul Friend) about Celtic wisdom - and the book of Blessings published just before he died almost two years exactly ago today aged just 53, looks like one to get hold of. Quiet reflection never a bad thing, in my book... and as you say, it is the time of year for it. May it be fruitful for you, and may you emerge from it, renewed, when you need to. I so think it is a good thing to be reflective. Sometimes we just need to stop and ponder our life....helps us to grow. Your images are amazing...I hope to make it to Paris one day. Hope 2010 brings you happiness with lots of special memories to cherish. Stunning!...HAPPY NEW YEAR TO YOU! Goodness, your photo of the Eiffel Tower especially is incroyable!! That first pic is just amazing, simply stunning. Thank you for your lovely comment on my blog - what is about January and feeling tired?! I think Vita S-W's poetry is not well known enough - I gave my father a copy of The Land for Christmas, which is lovely. 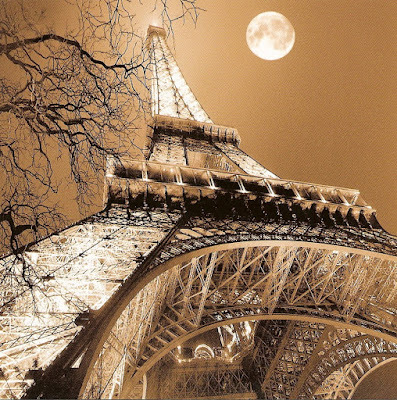 love your moon shot and Paris - you lucky thing.